Auntie Yan insisted on taking out for a walk last night... and THANK goodness she did... we were SO bored in the office as it has been quite some time since we actually went out. 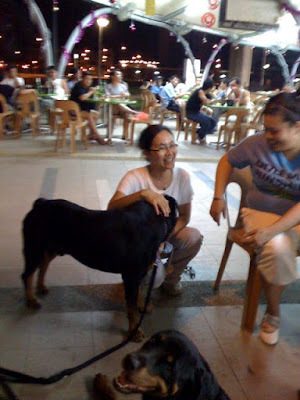 We didn't go anywhere far, just to the nearby foodcourt to chill and Pa had a bit to eat... We met up with these two brothers that were really fascinated with us. As they played with us, the other people were also a lot friendlier when they saw we were not some mad dogs that is ready to kill at any moment. Thank you Wilfred and Philbert. You were the highlight of our evening. Their mom also came over to chat with us... and we really look forward to meeting you guys again. Remember to work hard to get what you want! Everybody just looooove you guys! what a delightful fellow. 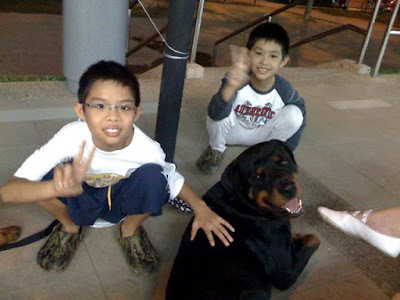 maybe he'll really be a vet in the future and would fight for the Rottie cause. Merry Christmas... Yet another Year has Past. Christmas is coming... Spread some Love.